We are an online publication aiming to provide opinion articles from local writers to a global readership. We hope that by writing about what’s going on in the place we live and by inviting people from everywhere else to read our articles, we can for this movement to encourage a true sense of global awareness. – one that is based on constructive discussion, sincere dialogue and the willingness to listen to and understand each other. We believe that in this day and age of a high interconnected world, it is rather disappointing that there still exists a disconnect between what is being reported by international media outlets and what is actually happening on the ground. The news media often report events from their own angle and perspectives without much regards to the feelings and thoughts of those who were actually involved in the news story. 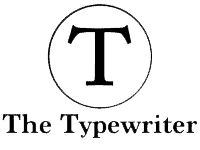 We believe that The Typewriter can help in rectifying this situation. By forming a community of writers from all across the globe who will writing about news events only from their own local perspectives, we believe that this will allow our readers to know more about each others’ country, cultures, worries and problems; and start to care about each other just a little bit more.